Pharaoh’s Arrow is a picture book that tells a fascinating story using authentic hieroglyphics and historic papyrus paintings. What was the inspiration that made you want to put this book together? I have taught elementary school for over 25 years. I have always found that using picture books is a great way to teach subjects like history and art to students. Picture books bring history alive. I found in teaching about Early Societies that there was an abundance of information books but not picture book narratives. I wanted to create a resource that teachers or any Egyptology fan could use and enjoy that included factual information but was also entertaining. I have always been fascinated by Ancient Egypt, so I thought this would be a great way to break into writing and illustrating picture books. Each piece of artwork in the book was done by you on papayri. What was that process like? I felt that you did a great job of getting the facts of ancient Egypt correct. What kind of research did you undertake for this book? I spent months researching how the Egyptian drew everything. I looked through lots of information books about Ancient Egypt. The Egyptians had a distinct way of drawing. Their style is simple yet graceful. I’ve heard the Egyptians described as the first graphic artists. People were drawn in profile but with forward facing eyes and shoulders. It is almost a contorted look. I also researched how trees, homes, palaces and animals were drawn. Egyptians didn’t uses perspective and size differences were usually due to importance, so sometimes the Pharaoh was drawn larger than everyone else. This made illustrating the book challenging because I couldn’t draw a lot of varied perspectives, such as a bird’s eye or an ant’s eye point of view. I really could only do some close ups in order to keep faithful to Egyptian style. My next book is totally different. It is a story about an overweight girl that longs to be a super hero, but her mother and aunt really pressure her to act like the other girls and try to be pretty and popular. When some bullies befriend her, she has to decide if this is the person she wants to be. I did the illustrations using cut paper and also dyed paper backgrounds. The book is in the editing stage, so I hope it will be ready by late summer. I am also writing a book about an Emperor and a dragon in Ancient China. It will be illustrated to look like Chinese silk paintings have come to life to tell the story. Akia loves living in an oasis far from the Nile River with her father. But when she is faced with another family tragedy, Akia embarks on a plan of revenge that takes her to the ancient capital of Memphis and to meet Almighty Pharaoh. She quickly learns that vengeance isn’t as easy as it may seem! Come visit Ancient Egypt through a tale told in rhyming couplets, authentic hieroglyphics and historic papyrus paintings come to life. Ages 8 – 11 or any Egyptology fan! 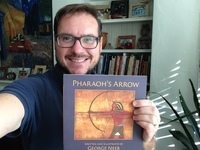 If you’re shopping for a picture book, George Neeb’s Pharaoh’s Arrow should be high on your list of choices. This unique book is an experience like you haven’t seen before – a whole book written and illustrated in the style of ancient Egypt! Neeb took the time to paint all the pages by hand and tell us a story of revenge set in the times of a bygone era. He studied Egyptian art and it shows on every page.. Every page is an individual work of art, bringing the artistic style of the Land of the pyramids into the modern format. While set in ancient times of the pharaohs, Neeb came up with the story himself. As he explained, he tried to get the facts correct. The style of clothing and the makeup match the era the story is set in and he spent a considerable amount of time giving his book the feel of an old papayri. He didn’t just stop at the characters, whom he painted in the drawing style of the ancient Egypt, but went as far to match the authentic hieroglyphics that appear throughout the story with the text! Pharaoh’s Arrow excels in the themes it takes us through. While picture books usually don’t trouble themselves with big moral questions, George Neeb had other ideas for his characters. What starts like a story of revenge ends up differently than you would expect. Without giving the details, you will be surprised with the decision the main character decided to go with. And while odd, the decision is very practical. Considering the times the story is happening the decision is quite fitting. I felt that Neeb’s poetry was not his strong suit and were not lyrically challenging, but he is still able to tell an interesting story. Many odds and ends of the life of ancient Egypt show throughout the book. The story starts in quite an unusual way – the mother of Akia, our heroine, is killed by a crocodile which makes her father decide to live in the desert. Crocodiles where a predator on the Nile back in the day and the situation gives us a glimpse of life thousands of years ago. Burial rites of the ancient Egypt are also referenced and Neeb also talks about the spirituality that the people of those times were observing. His reference of “ba”, roughly translated as the modern concept of the soul, is something you will not find in many books that deal with this long gone civilization! The illustrations are unique and make it an unforgettable work of art. 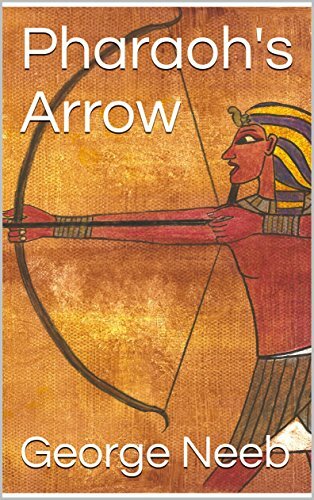 At the end of the book Neeb even explains how to accomplish the style yourself, making the Pharaoh’s Arrow a perfect choice for anyone interested in painting and history.